I have been reading about startups over the last few months. From Lean Startup, The Launch Pad, Venture Deals and a few more. The more I have read about the Startup eco system the more it has intrigued me. The Software and Tech startup is particularly interesting to me. Previously I have always viewed software startups as a little to complicated. My preference has been for more Internet based businesses that used some tech, but not groundbreaking software businesses. My reading list has however started to change my mind about it, and with my new challenge to learn to code, I have been looking to potential software business ideas. This week Jano forwarded me a link to an article I found absolutely fascinating. It is a long Essay by Paul Graham, the founder of Y Combinatory in Silicon Valley. The title “How to get Startup Ideas” was enough to get me to read through this 14 page essay and I enjoyed every moment of it. 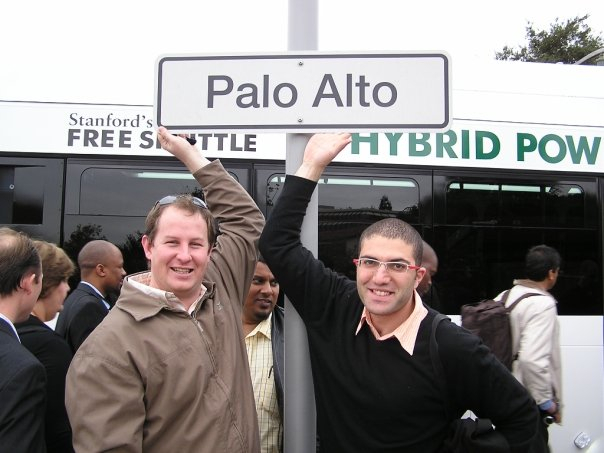 Me and @yossihasson in Silicon Valley back in 2009, Palo Alto features in the Startup Dream of many people! He also argues that you have to make sure you tackle a “problem”, mostly because in order to get people to start using your service early and even in its most elementary form you have to elevate some pain for them. Seeing that a small startup team is limited in what it can build in version one, he suggests that they tackle “something a small number of people want a large amount”. One of the great traps he talks about is when you artificially try to come up with ideas for startups. In this thought process he argues that bad ideas sound really plausible. Or you convince yourself that an idea is good because you are under pressure to come up with something. I found vindication for some thoughts that I have been playing with, I think learning to code might well turn out to be a great investment of time, then it might be worth it to work for a great software or tech startup at the forefront of their field. Who knows what the future might bring, but ‘The Startup Dream’ sure looks exciting from here! This entry was posted in Getting Ready on 2012/11/26 by Justinus.